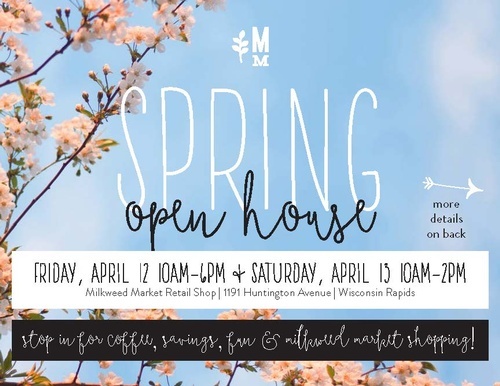 Join us for our first ever Spring Open House! We’ll have complimentary coffee and sweet treats for sale – our popular gourmet cookies plus made-from-scratch cupcakes by Slice of Heaven. Shop new décor and giftware, then pick an Easter egg at checkout to get 10%, 15% or even 20% OFF your ENTIRE purchase! *not for use on gift certificates, make & take projects, baked goods or Ink Splash apparel. Sign up to win 1 of 2 Milkweed Market Easter basket raffle prizes. Each basket over a $50 VALUE! Double your chances of winning by shopping both days! Last but not least, get your hands dirty during our make & take sessions where you can paint and create your own Spring sign for just $25! Sessions will run on Friday from 10AM to 4PM and Saturday from 10AM to 1PM. No reservations needed! First come, first served!